The human body consists of a variety of tissues and cavities with different physical and radiological properties. Most important among these, from a radi- ation dosimetry perspective, are tissues and cavities that are radiologically dif- ferent from water, including lungs, oral cavities, teeth, nasal passages, sinuses, and bones. The dose distribution is affected by these tissue inhomogeneities and since treatments are becoming increasingly conformal, the opportunity for geo- graphic misses of the target due to incorrect isodose coverage increases. In view of the inconsistent use of inhomogeneity corrections, the recent advances in the dose calculation algorithms, the improved 3D image acquisition and display capabilities, and the trend towards dose escalation in smaller target volumes, the Radiation Therapy Committee (RTC) of the American Association of Physicists in Medicine (AAPM) commissioned Task Group 65 (TG 65) to review this subject specifically for megavoltage photon beams. 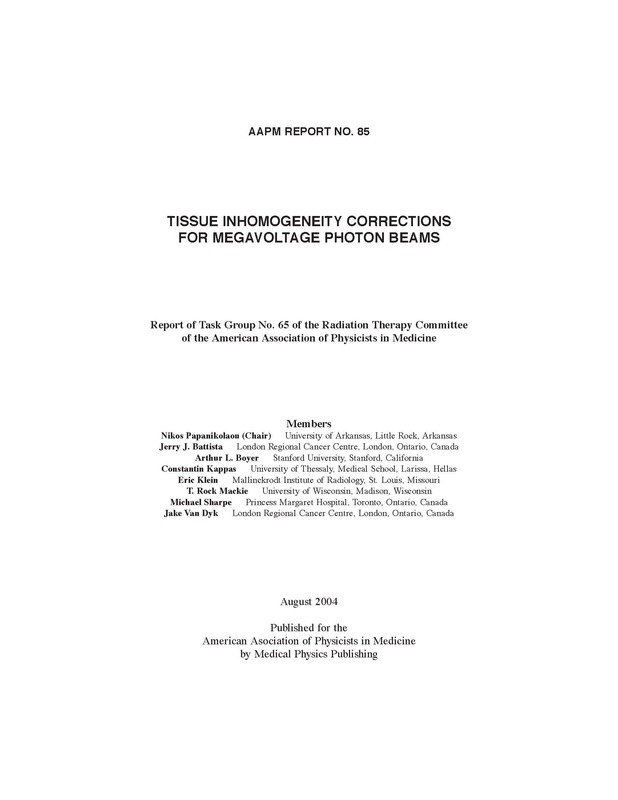 The specific objectives of this Task Group are: (a) to review the clinical need for inhomo- geneity corrections and the currently available methodologies for tissue inho- mogeneity corrections in photon beams; (b) to assess the known advantages and disadvantages of each of the currently available algorithms; (c) to make recommendations regarding the types of procedures that should be used to assess the accuracy of inhomogeneity correction procedures and the clinical application of specific inhomogeneity corrections for different anatomical regions. This report summarizes the findings of the Task Group and aims to provide the practicing clinical medical physicist with sufficient physical and mathematical insight into the inhomogeneity problem to be able to discern the capabilities and limitations of the particular method(s) available, to advise radi- ation oncologists as to the accuracy of the predicted doses and prescriptions, and to advise both so they are able to make informed decisions during the pur- chase of treatment planning systems.